Some one had said once , If you really need to know a person travel with him!! . 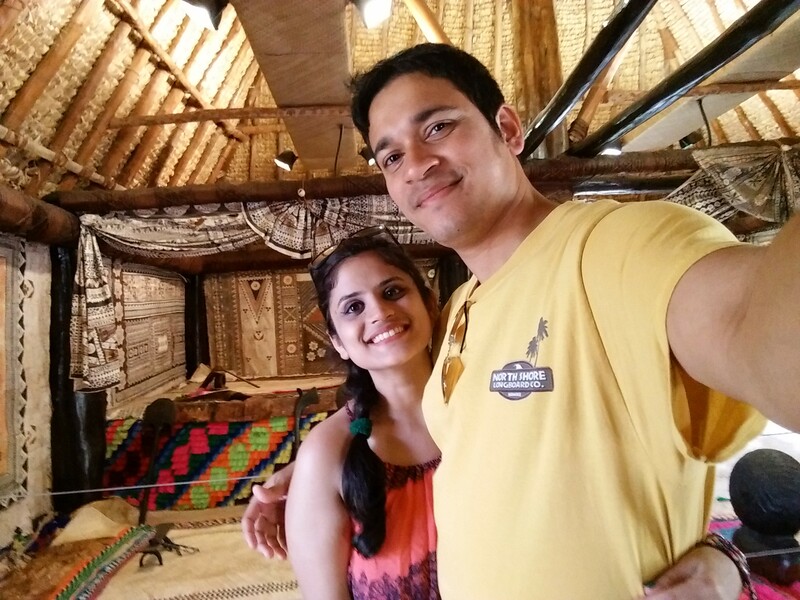 and what can be better than travelling with the person u meant to marry . 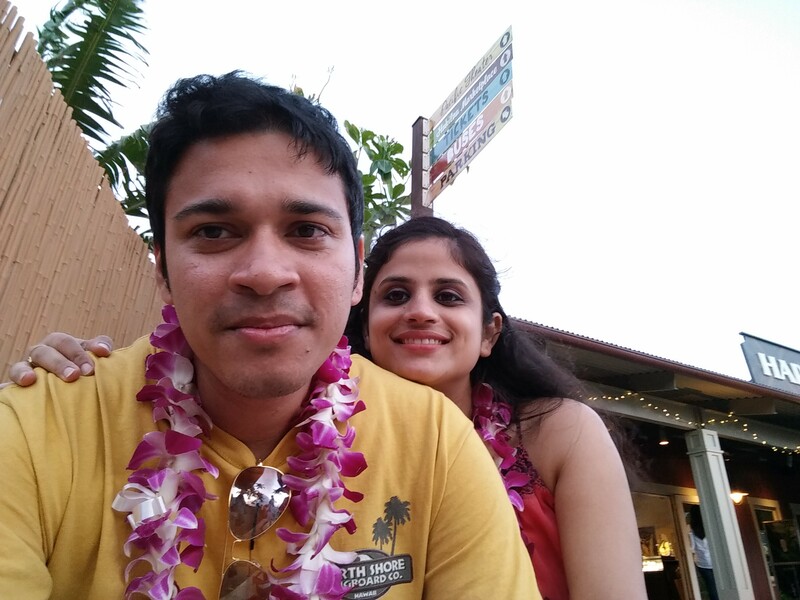 My case was little different though , The first real travel i did with td was after marriage only.so here what all happened in our lovely 5 days in the land of beaches ,The Hawaii. 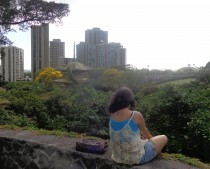 The time we landed in Hawaii .. we could smell the freshness of the weather .. I got the same feeling as I get when am in the beach of my home town. the sultry air with a tinge of wet ness, after the dry cold weather of California it was like a breath of freshness for me. After landing we booked a cab and reached our destination hotel of 5 days, The pacific hotel. standing on the balcony of our 11 floor apartment , i could see the Sea.How black it looked , like a big serpent gushing and rumbling through the sand.. but i could feel the air , the lovely scent of sea.That night it rained!! as if it welcomed us. i looked at td and i could feel his happiness too.after all it was his vacation after long hours in office . The day started with us having ready to do some sight-seeing and lazing around the sea.but fate had its own plans for us.i being naive (and foolish sometimes) were tricked into attending a presentation on some real estates purchase(mind it never Fall into such traps!). we were lured into the scam by free lunch offer and rebate in our booking of rented car.but we didnt really grasped the thing that in return they were taking our precious time !! the whole afternoon was lost with meandering with these real estates people. after it was over , we managed to get back to our hotels, thoroughly sad that we lost almost half a Day . we had a small argumment also over this , but this was not something in our mind for our first real trip together so we kept it aside and tried having a good time . for The evening I had booked the Makani catamaran Cruise for td and me, so we just got ready and rushed to our cruise.It was td’s birthday, and I wanted to make it special for him, so i had this special friday night fireworks ( sunset) with dinner buffet package booked to make it little extra special for my guy. The cruise was lovely , though a short one.but the food was not good, not many varieties and it was cold .I had expected at-least a decent one considering the money we had paid.Anyway when the evening came all my owes vanished with the western sky coming to light its aura with the orange hue . It was a mesmerizing sight of the Hawaiian city drenched in the last remaining drops of orange of the sky , basking in the glory of the sunset , and the wind playing the symphony in the background. It was this perfect romantic evening with the love of my life. 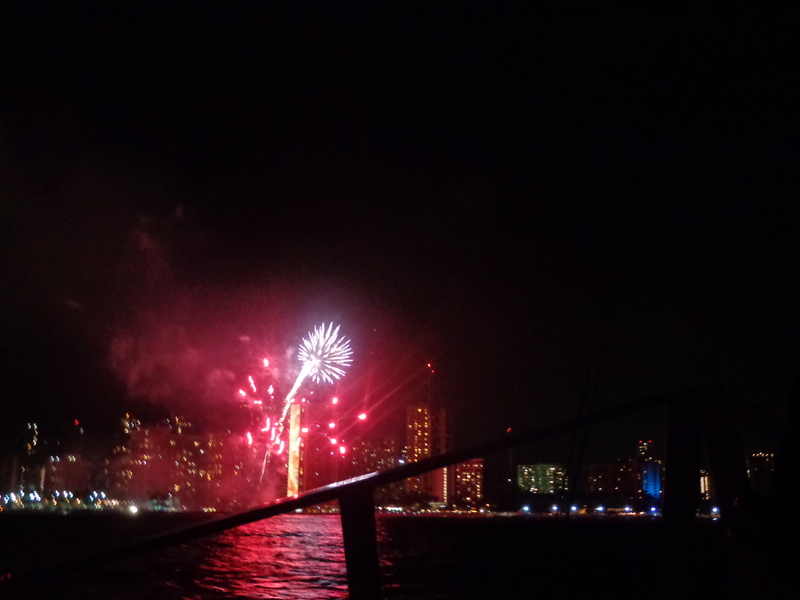 The people on board were eagerly waiting for the fireworks to start .The firework was a special addition in the package of Friday night dinner buffet and mostly the hotels on the sea-shore would lit up the fireworks at a designated time and it goes on for almost 15 minutes. so after some wait ,Suddenly one part of the sky just lit up with varied colors of light. it was a spectacular moment ,the small cruise, music, and the famous drink of Hawaii , Mai Tai made it even more beautiful to enjoy. 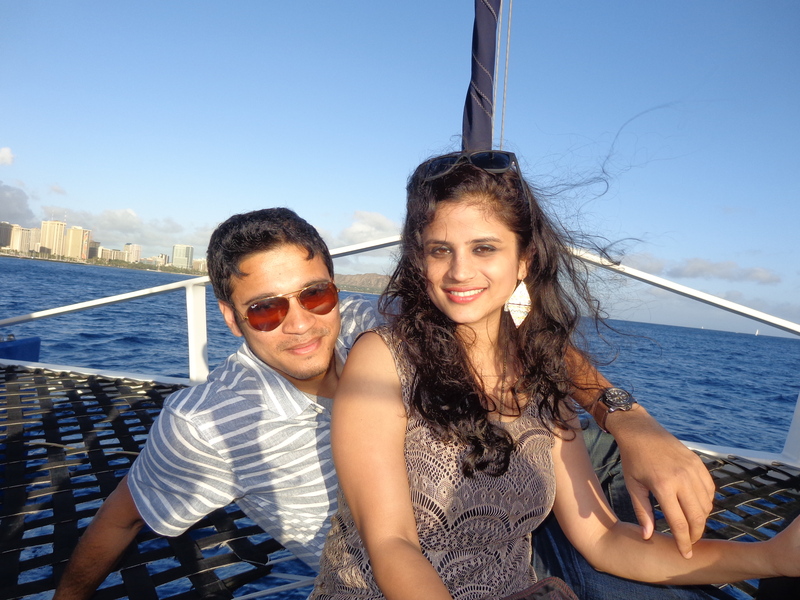 with td by my side and the romantic cool breeze of the sea, I think it was a perfect birthday bash for my better half. Finally the night batted its eye on the city that never sleeps and there we went back to our hotel and the night ended with we being in each others arms. So here what i learnt today that we both are very bad at planning things and td becomes really grumpy when i start nagging and so i had to be extra careful in dealing with a grumpy cat ( :p ) henceforth . 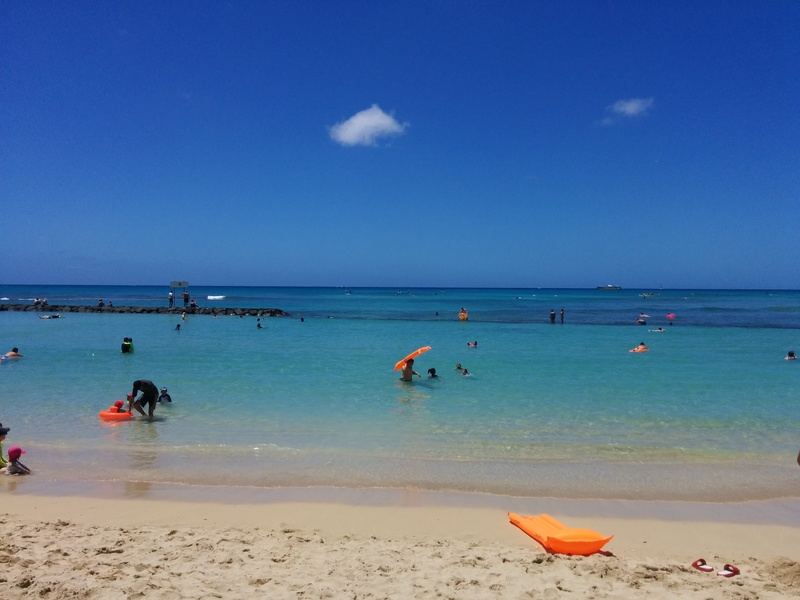 We had purchased this Oahu card , which is kind of a pass which includes the entry fees for many of the tourist spots out there. 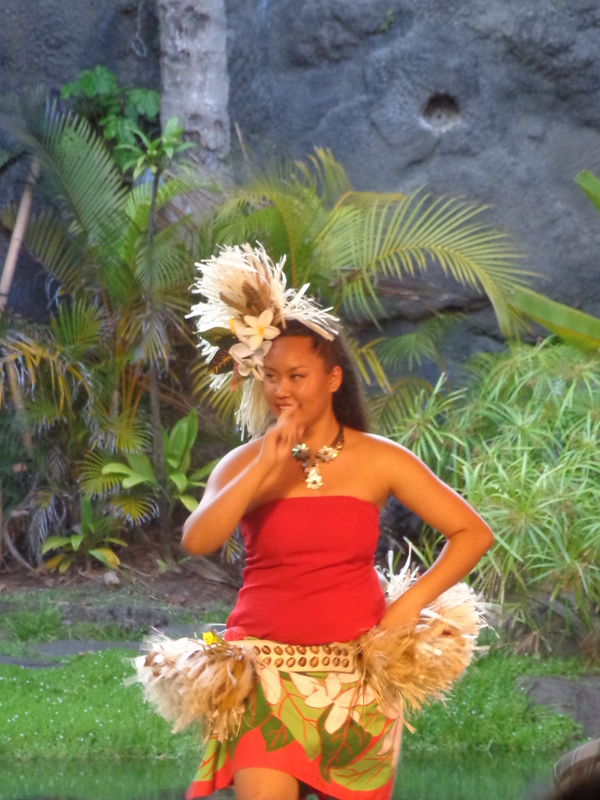 and ours also included the famous tour of Polynesian culture center.now before coming to Hawaii, i had read many reviews and blogs to finally select this Activity. PCC is this huge conglomerate entertainment house which houses the 7 Villages constituting Polynesia, Philipines, Hawaii, Tonga,Tahiti,Fiji,Marquesas, Samoa,Aotearoa.Each village has something different to offer starting from food , dance to shelter, each has its own way of thriving. and that was the highlight of the PCC. we had rented a car to the place and drove for around 2 hrs to reach there. but on the way we had wonderful time in enjoying the beautiful drive to north shore (where PCC was located). 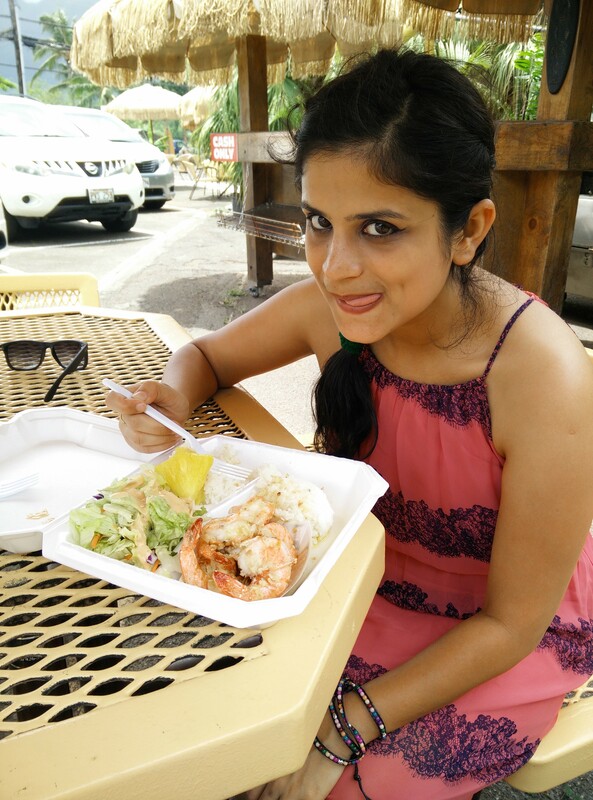 me and td both love exploring new types of food and how could we miss the famous road side Huli Huli Chicken shack , but ironically we didn’t had any chicken there , but we tried the shrimps and fish instead. it was tasty to the core and we were more than satisfied. then another time we stopped in one of the random place by the sea side. 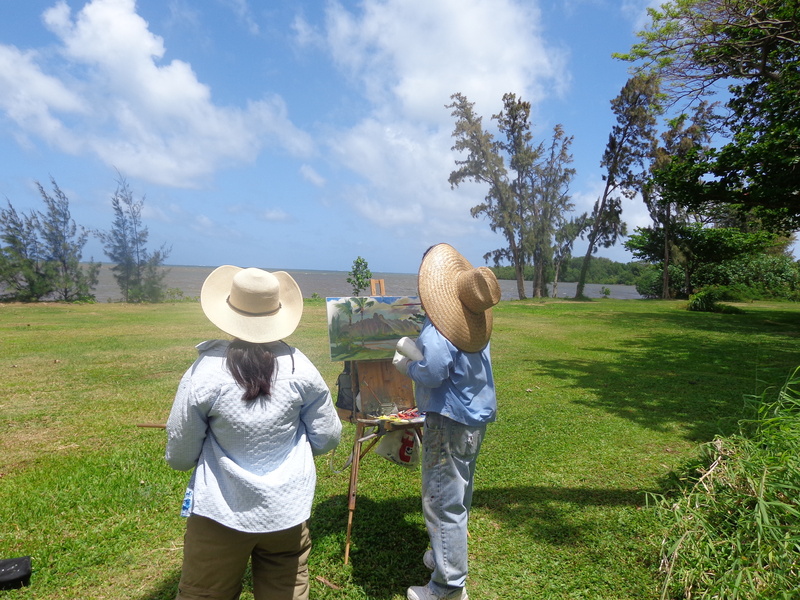 it was a small spot along the sea , where one painter was busy in capturing the beauty surrounding him in his brush strokes. it all looked like a painting . we stopped for a while there and enjoyed the calmness that place offered. 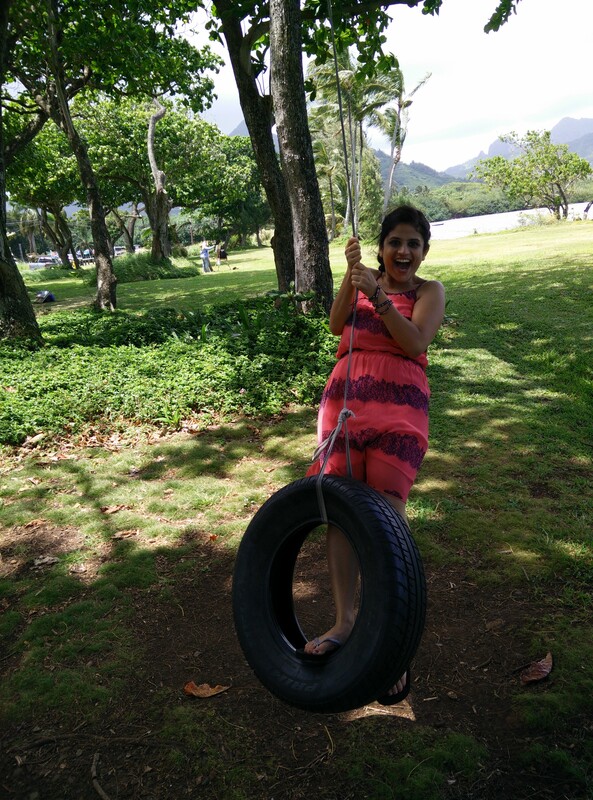 i also tried swinging in the tyre which was hanging from one of the tree. it was so tough , i fell down for 2 -3 times, finally managed to get on the tyre for few seconds just to take a snap :p . Td was laughing all through it and looking at me fondly at my childishness. who could have said by looking at us that we were a married couple and mature enough to be calmly enjoying the place. but who cares we were like these two kids who were left free to do whatever they want. its such a small moment but its like engraved in my memory forever. anyway who really wants to grow up ?!! So after all these silly funny activities we finally reached the place.they have a reception area , where they give you brochure which includes the map of this huge place and timings of the various shows in the 7 villages. we had already booked the tour , but various other types of passes were available like day passes or half day passes. There were 3 primary options for dinning experience in the center . Alii Luau Buffet, Prime dinning and island buffet. we had booked the ALii Luau buffet. You can book anything according to your preference and time feasibility as it’s a huge place and you need a whole day to experience all of it.we had called the pcc before our arrival and booked our appointment,but when we reached there the lady at reception told she was not able to find our appointment . but it didn’t matter much , they made a booking right away. 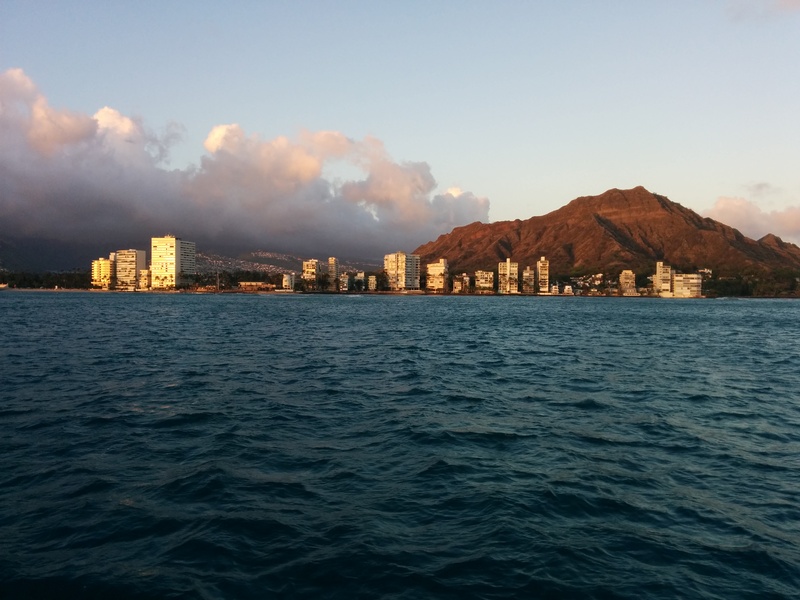 Though this tour is included in the Oahu card still you have to make a booking for the touring activity as it gets very crowded there. The day was hot and for few minutes I became restless as already we had driven for long and before even starting the tour i was tired 😦 . but slowly with passing time i got used the heat and started enjoying. 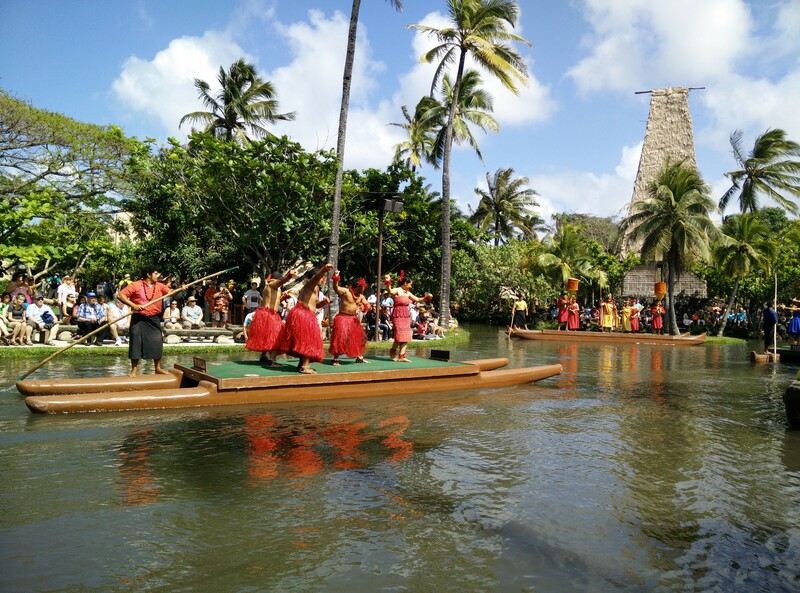 I don’t remember each of the individual activities we did in the villages , but some of the mention worthy were the Tahitian wedding ceremony and Tonga dance performance. Apart from various village experiences there were other performances too like the canoe pageant.Its a over the water performance where each village demonstrate their traditional dance on the boats. with lots of colourful costumes and melodious songs , the beats of the drums, the surrounding becomes very energetic and refreshing. its one of its kind , never to miss it. we also took a small tour of the hut of the chief of Fiji. it was a beautiful hut with all kinds of hand-woven carpets and rugs and clay pots with beautiful carvings on it , and a master bed on one side. which was decorated with shells and beautiful rugs. The place was full of sights , performances and smells that engraved our minds with its footprint for a long time to come.The dance performances of each of the village was their way of story telling of their culture and history. The evening started with the Mouth watering dinner experiences at the Hale Aloha venue.it had varieties of offerings starting from fish , meat to pork.and for vegetarians they had other special dishes on order. The surrounding was overflowing with Mai tai, smells of delicious food and the dance of the beautiful Hawaiian. what a perfect dinning experience it was. it was relaxing and delicious. they also gifted each of us with a flower crown . ( i wanted one since the time i landed in Hawaii 🙂 ) . After the dinner we were guided to the convention Hall where the famous Ha ! Breath Of Life luau performance is organized.It’s very difficult to explain in words the Breath of life.Imagine if you can witness the circle of life , the time when it begins to the time it ends and again emerges, all in-front of your eyes with the simplicity of how a small caterpillar emerges from its coccun and struggles through life to finally become a beautiful butterfly and fly high and one day fall to sleep for ever . and again reemerge into this world with another story of its own. So it was similar but more grandeur in nature. 100s of Polynesians from all the villages danced together to bring life the story of a small boy of one of the village .his first cry , his first look at his parents to his first encounter with love and death. The time when he fought against the rival tribes to the moment when he himself became a father , it was all marvelously demonstrated. The story was about the love we share with our family , with our parents , friends and partners. It was about sacrifice and trust and honesty. i was moved with the sheer courage of these people to potray the real substance of our lives , our family and the bond we share with them. it was vividly depicted by the dancers and performers .They used all types of light and sound gimmicks and colourful costumes to enthrall us. Finally the night ended with we being blown out of our minds. how strange it is , now when we are so technically evoloved and have computers on our finger tips to explore everything , still something which is so original within each of us can move us to the core. Our origin!! . The evolution of human , that is something which will always amuse me. Hope these kind of shows are still there even after 100 s of years which can connect the then human to his roots. It was one hell of a night . Experiencing the life and also the end of it together thus completing the circle of life. We drove back to our hotel and called it a day . The last thought in my mind was the circle of life , it somehow saddened me . I realized everything shall come to an end as the change is inevitable and we all shall have to embrace , even though we don’t like it.I held onto td (who was already slept for a while now) and looked at his calm face . I loved him even more now for I realized i have now one day less to love him as this day has already passed.I learnt he is like a little kid at heart like me and we both love doing small things together. the swing , i can never forget that moment and the mischevious look in his eyes.